A review of Networks of Music and History: Vilayat Khan and the Emerging Sitar, by Hans Utter. In a crisply written dissertation, Hans Utter brings various threads of untapped history together with a sophisticated theoretical approach to examine the sitar as a symbol and index of India’s past, present and future. The dissertation is concerned with understanding the sitar’s various meanings, as an instrument, as a performance practice and a musical genre in ways that speak to larger, congruent issues in modern India. As Utter queries in the opening pages, “Can the examination of a single musical instrument trace the complexities of India’s multifaceted culture?” The answer is thus the premise for the dissertation’s multi-pronged approach — opening with a historical backdrop, revising said backdrop towards including subaltern and marginalized voices of Muslim performers like Ustad Vilayat Khan and extending such inquiries into contemporary musical practices across South Asia and its diasporas. One of the greatest strengths of this dissertation is Utter’s application of assemblage and actor-network theory. Drawing primarily from the work of Gilles Deleuze, Bruno Latour, Félix Guattari and Manuel De Landa, the dissertation proposes a new and dynamic route for South Asian studies that seeks to invigorate our approach to performance in/as culture by emphasizing the kaleidoscope of meanings the sitar engenders across social, economic, class, religious and aesthetic spectrums. In this regard, Utter’s work addresses a pressing dilemma for many cultural anthropologists and ethnomusicologists working on contemporary South Asia who are grappling with the limitations of globalization and diasporic theoretical frameworks on the one hand, and the fading relevance of postcolonial theory in ethnographically-driven inquires. Utter’s work is unique in the historiography of North Indian (Hindustani) music for the emphasis it places on situating subaltern voices such as Ustad Vilayat Khan’s. More broadly, this work belongs to a larger trend, in the wake of Janaki Bakhle’s controversial work, Two Men and Music, which strives to understand the codification and institutionalization of Indian music systems as an aspect of nation-formation alongside the dispersal of Indian music and its meaning in diasporic and globalizing modernities (Janaki Bakhle, Two Men and Music: Nationalism in the Making of an Indian Classical Tradition. Oxford: Oxford University Press, 2005). Indeed, this dissertation joins recent conversations that seek to include Muslim or otherwise peripheral voices within a larger narrative of Indian culture and history (for instance, Katherine Butler Schofield, “Reviving the Golden Age again: ‘Classicization’, Hindustani Music, and the Mughals” in Ethnomusicology 54 (2010), pp. 484-517; Max Katz, “Institutional Communalism in North Indian Classical Music” in Ethnomusciology 56 (2012), pp. 279-298). Utter’s work suggests an exciting new direction for postcolonial studies in general and ethnomusicology in particular as he joins a growing chorus of scholars studying contemporary South Asia and all of its complexities. The dissertation consists of eight chapters and can be divided into two major sections. In the first section (Chapters 1-3) Utter presents an overview of the historical foundations upon which his dissertation is based. He provides an account, as it were, of the history of Indian music history in Chapter 2, emphasizing the importance of the Sufi legacy and Muslim patronage, as well as the impact of British colonialism. In this discussion, Utter articulates his revisionist philosophy, identifying the British as responsible for devaluing and otherwise obscuring the trajectory of Hindustani music as a hybrid, Indo-Islamic cultural product. As he laments, “In one of the greatest tragedies of history, the culmination of over eleven hundred years of Indo-Islamic cultural fusion was decimated by the systematic efforts of the British Raj” (p. 51). Utter brings Bruno Latour’s understanding of sedimentary time to understand these various periods of Indian history and cultural rupture. By doing so, he proposes a vertical understanding of time and space (as opposed a teleological, horizontal trajectory) in which meaning accrues and intermingles. It is a powerful argument, and one which any ethnographer of India will readily appreciate for it resonates with the reality of Indian modernities, which cannot and will not ever relegate the past to the past. Chapter 3 offers a dense, but fruitful discussion of Utter’s proposed theoretical intervention. At its core, the work done in this chapter fuses postcolonial and globalization theories and thus provides a sophisticated suggestion as to how ethnomusicology might reconceptualize its approach to broad topics like tradition, authenticity, commodification and power in the wake of disciplinary polarities represented in the work of Veit Erlmann and Mark Slobin beginning in the 1990s. By bringing Deleuze, Guattari and Latour into this conversation, Utter posits a new model of hybridity (as a product of postcoloniality as well as globalization) that rejects the subject-object divide fundamental to previous notions of cultural change, suggesting, instead, that we view musical processes as polyvalent (rhizome in Delueze and Guattari’s terminology), across time and space. This theoretical formulation is both timely and compelling. Ethnomusicologists, particularly those working in South Asia and across the global south will undoubtedly find this discussion resonant and stimulating. The second section of the dissertation (Chapters 4-8) applies Utter’s understanding of network to bear on a history of the sitar and its performance. Chapter 4 draws primarily from Latour’s theories of assembly, interpreting the sitar itself as “a network that encompasses practices, contesting narratives, and socially mediated energy flows” (p. 108). Importantly, Utter uses this theoretical framework to situate the sitar within a complex colonial milieu that blended Muslim, Hindu and court cultures. 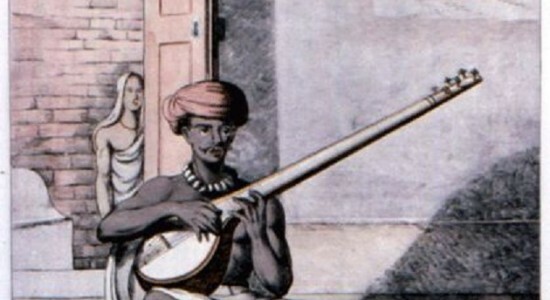 Chapter 5 follows the historical trajectory to Calcutta, focusing on the rising popularity of the sitar as a symbolic instrument in the Bengali Renaissance. This discussion highlights the artistic legacies of Imdad Khan and his family of musicians (otherwise known as the Imdad Khan gharana), focusing particularly on how this group of musicians established the sitar as a site for cultural meaning. Chapter 6 follows this historical trajectory into the post-independence, nationalist era through the musicianship of Vilayat Khan, a product of the Imdad Khan gharana to contextualize the relative legacy of Ravi Shankar’s style of sitar-playing. Chapter 7 zeros in on the musical qualities for which the Imdad Khan gharana is best known, the gayaki ang (literally, vocal or singing style). Hans Utter’s dissertation tells a fascinating story about the history and meaning of the sitar. By combining methodologies across phenomenological, ontological and empirical lines, this work takes ethnomusicology to where many, like myself, would like to see it go more often — a conceptual dimension where “music’s interpenetration with culture” emerges as a dynamic process within larger narratives about how societies change and grow. Ohio State University. 2011. 408 pp. Primary Advisor: Margarita Mazo. Image: From François Balthazar Solvyns, Les Hindoûs, 4 vols (Paris: Chez L’Auteur, 1808-1812), Vol. II. 7.2. “Sittar, or Guittar”. Wikimedia Commons.